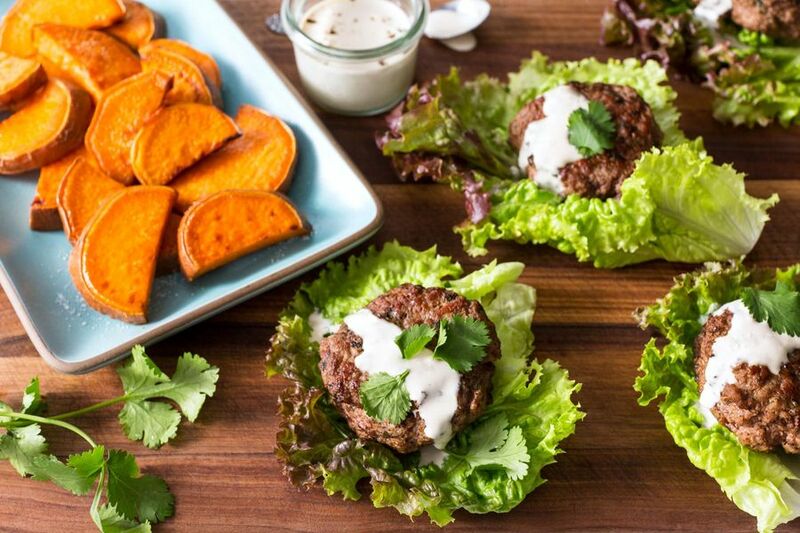 Our creamy lemon-tahini mayo brightens these Middle Eastern–spiced lamb sliders and paleo sweet potato fries. Calories: 610, Protein: 31g (62% DV), Fiber: 5g (20% DV), Total Fat: 42g (65% DV), Monounsaturated Fat: 23g, Polyunsaturated Fat: 3.5g, Saturated Fat: 9g (45% DV), Cholesterol: 75mg (25% DV), Sodium: 370mg (15% DV), Carbohydrates: 28g (9% DV), Total Sugars: 6g, Added Sugars: 0g (0% DV). Scrub or peel the sweet potato. Trim the ends and cut the potato in half lengthwise, then crosswise into ¼-inch-thick half-moons. On a sheet pan, drizzle the sweet potato with 1 to 2 tablespoons oil; season generously with salt and pepper and toss to coat. Spread in an even layer and roast, turning once halfway through, until the potato is tender and lightly browned, 20 to 25 minutes. While the sweet potato roasts, prepare the patties. In a large bowl, combine the ground lamb, baharat, and half the cilantro. Season generously with salt and pepper and mix gently until just combined. Using wet hands, form the mixture into four [eight] ½-inch-thick patties. In a large frying pan over medium-high heat, warm 1 to 2 tablespoons oil until hot but not smoking. Working in batches if needed, add the patties and cook, turning once, until browned and cooked through, 2 to 3 minutes per side for medium. Transfer to a plate. Add more oil between batches if needed. While the patties cook, prepare the lettuce and lemon-tahini mayo. Trim the root end from the lettuce; remove 4  of the largest outer leaves for the sliders and save the remaining lettuce for another use. In a small bowl, stir together the lemon-tahini dressing base, mayo, and 1 tablespoon [2 TBL] oil. Season to taste with salt and pepper. Transfer the lettuce leaves to individual plates. Top with the slider patties, drizzle 1 tablespoon [2 TBL] lemon-tahini mayo on top, and garnish with the remaining cilantro. Serve the sweet potato and remaining lemon-tahini mayo on the side. Season and toss the sweet potato.